Since the original Timemachine Road was released in 2012, aero road bikes have become a mainstay in most major manufacturers’ catalogs. That’s why when the Timemachine Road was not included in BMC’s 2018 lineup, we were left wondering if they had something new in the works. They did. BMC’s 2019 flagship Timemachine Road 01 is changing what is to be expected of an aero bike. 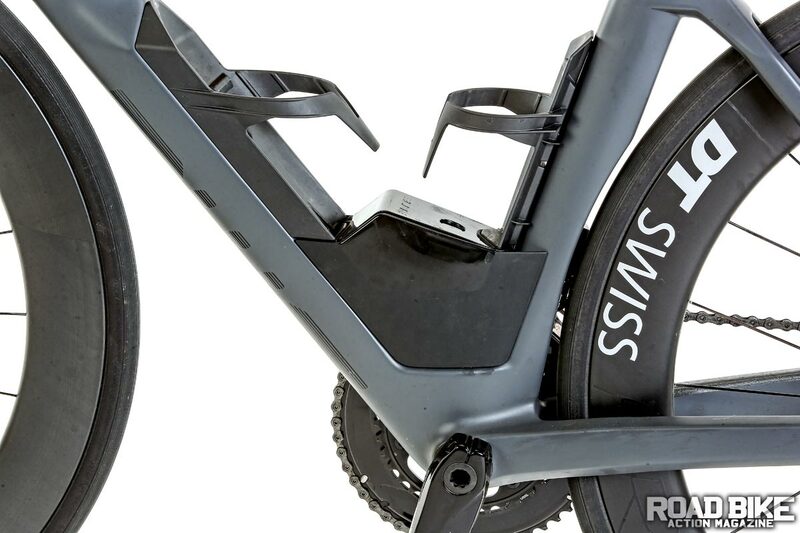 Now celebrating its 25th anniversary, the Swiss bicycle manufacturer’s latest aero innovation has upped the ante in the wind-cheating segment. The 2017 Timemachine Road’s choppy ride quality, minimal compliance and poor rim brakes left much to be desired. Much to our liking, the 2019 Timemachine Road 01 has refined these faults and taken BMC to the forefront of aero innovation. BMC’s engineers and designers were justified in taking their time to release the latest Timemachine. A flat top tube and Kamm-tail seat tube take your eyes from the front end to BMC’s fully integrated bottle cages and aero-module storage box, then on to the low rear triangle. The muted gray and red colorway paired with the subtle BMC branding on the sides of the head tube give the frame a stealthy look. The frame is based on BMC’s Tuned Compliance Concept and is built to have a distinctive ride quality owing to the top-tier carbon used for all of the Timemachine frames. The Tuned Compliance Concept uses data gathered from BMC’s in-house R&D facility to improve compliance while retaining lateral stiffness. The clearest example of this is the low seatstays in the rear triangle. The BMC was the first bike we’ve tested that had an integrated caliper fairing. It’s a novel idea and something we expect to see more often in the battle for more aero advantage. Now included with the frameset is a pair of integrated bottle cages and a storage module that not only help give the Timemachine its futuristic look but were included in the overall package tested in the wind tunnel. Nearly every other manufacturer does their aero testing without bottle cages. Unfortunately, for most aero bikes, the additional drag caused by bottle cages negates the aero gains in real-world conditions. BMC tested the Timemachine until they found an ideal design with the proper amount of aerodynamics. We found that while the cages work great with their Elite-branded bottles, they don’t work so well with others. Onto the numbers, the size 54 we tested has a long 100.3cm wheelbase with 41cm-long chainstays. BMC raised the bottom bracket to have a 6cm drop, which is relatively less than other recently released aero bikes. They claim this provides better power transfer throughout the frame. 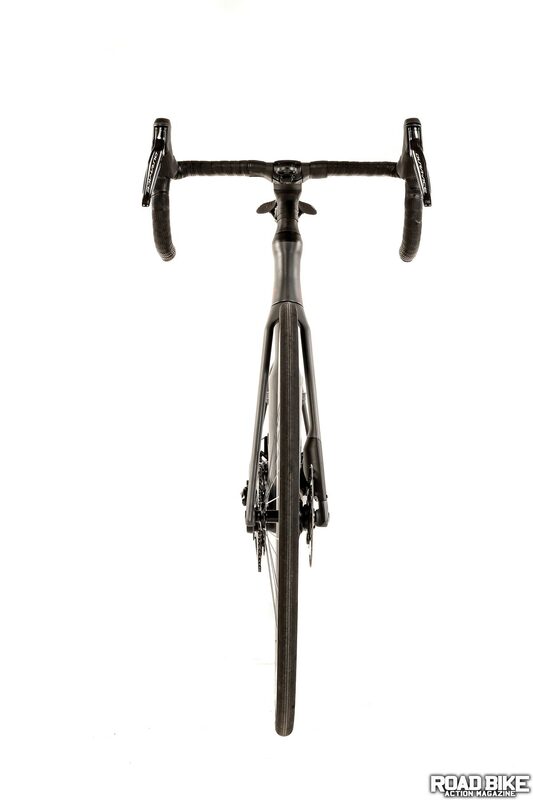 A 14.6cm-tall head tube keeps the front end low for optimal aerodynamics. 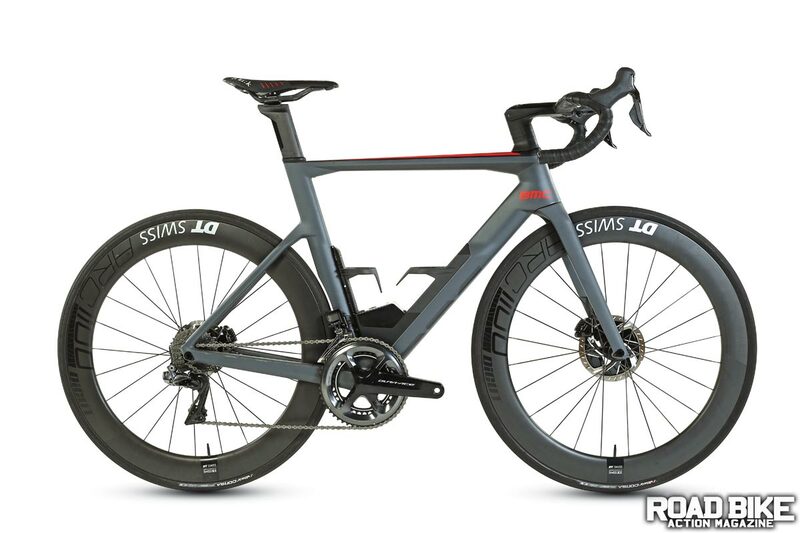 Unlike its predecessor, the 2019 Timemachine Road is designed around disc brakes with a unique plastic fairing over the front direct-mount brake caliper for optimized aerodynamics. Helping maintain the aero qualities, the 12mm thru-axles have no external handle and require a 6mm Allen key. The Timemachine’s Kamm-tail seatpost can be reversed to provide up to 30mm of adjustment, which would be an especially useful feature for anyone who used the bike for a triathlon. BMC chose to only use premium drivetrains from Shimano and SRAM on the Timemachine builds. The One is spec’d with a Shimano Dura-Ace Di2 groupset, the $11,000 Two uses SRAM’s Red e-Tap and the $8500 “entry-level” Three uses a Shimano Ultegra Di2 drivetrain. Semi-compact chainrings and an 11-30 rear cassette provide what’s becoming the industry’s standard gear range. Not to be understated is BMC’s use of their Integrated Cockpit System. The flat and thin 110mm stem and 42cm handlebar combo keep the internal cables clean and out of sight. The system reduces drag with its low-profile design. Inside the head tube there’s extra space for cable slack. This allows for simple adjustments of the gated spacers and stem to hone in on the proper fit without the hassle of disconnecting the hydraulic lines, which should save you time and money if you’re making adjustments at the bike shop. For a bike at this price point, the plastic aero module feels a bit cheap. We like that the bottle cages and storage box are removeable. Standard cages can be mounted as well. While the cockpit raises the bar for integration, it leaves customization completely out of the picture. With nearly no other 25.8mm-diameter handlebars on the market, it is nearly impossible to personalize the cockpit without changing both the stem too. Even though it would greatly alter the aerodynamics when changed, if the handlebar does not fit you properly or is uncomfortable, it will require the extra step of finding a compatible stem. Helping maximize the Swiss effect, DT Swiss’ top-tier Arc 1100 Dicut 62 wheels are spec’d on the build. 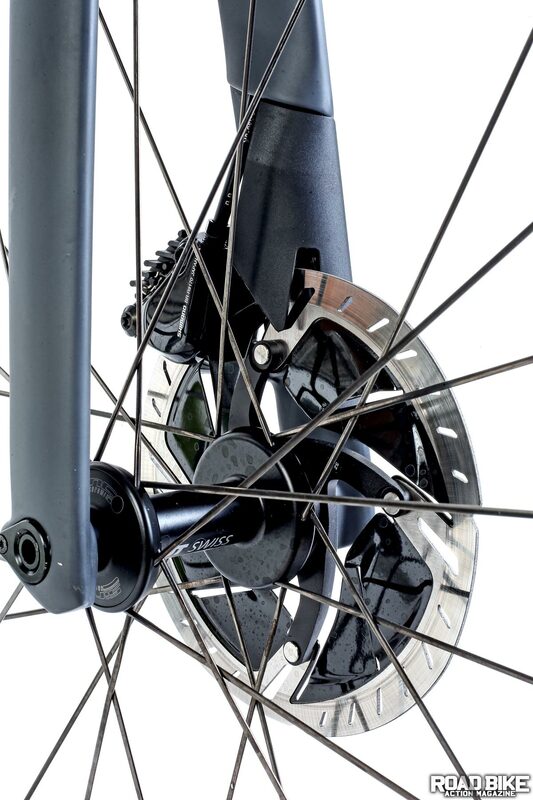 The 62mm-deep wheels have a 17mm internal width. They are tubeless-ready with rim strips installed and valves included. Narrower than more contemporary wheels, the 1100s were designed with aerodynamics in mind and make for an ideal fit for BMC’s wind slicer. Leave it to BMC to challenge the common perception of how an aero bike should ride. The Timemachine Road 01 is impressively smooth and stable. 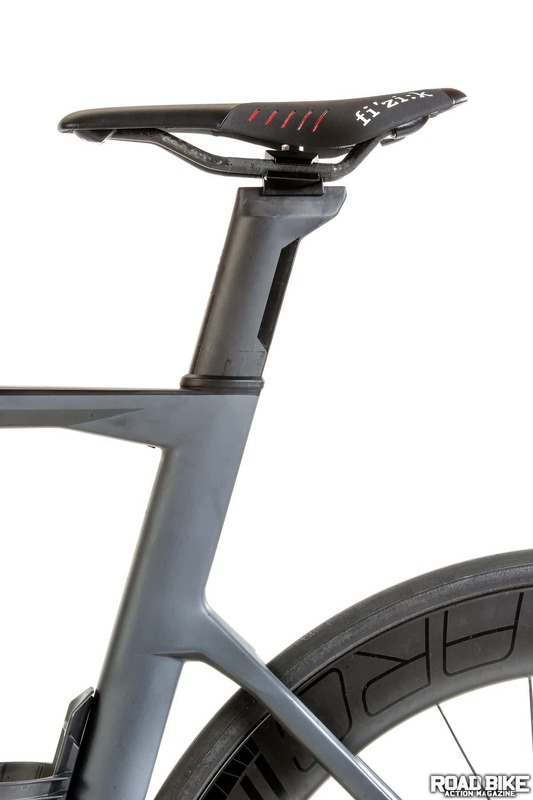 Improved handling and compliance have been missing in the aero bike market for years, and manufacturers are just getting around to changing things. The handlebar is compliant and absorbs road vibrations while remaining efficient during hard efforts in the drops. The improvements BMC has made to the Timemachine make it a viable option for gran fondos and other long rides that less compliant bikes would leave you more sore much sooner. 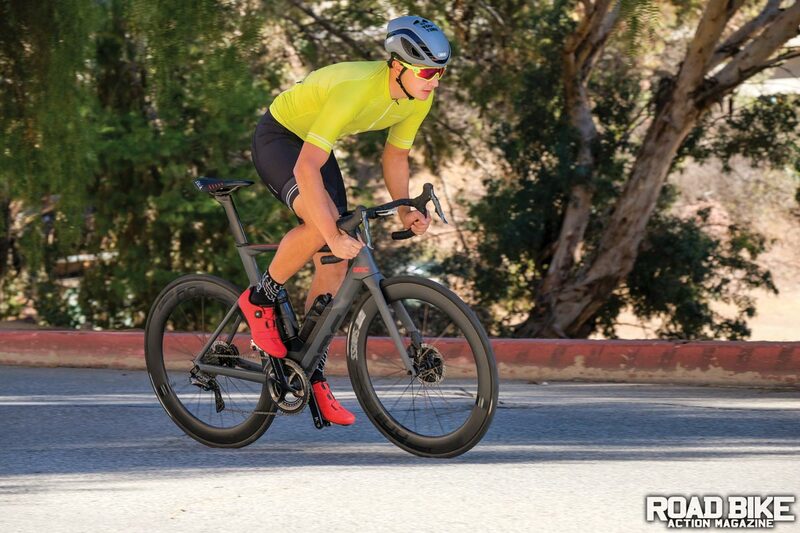 Whether it was tucked in the draft of the peloton or pushing a steady tempo on a climb, our test riders remarked how the bike feels like it maintains its speed over nearly all terrain. Like other modern aero road bikes, the BMC is agile. Wide-sweeping corners can be taken at speed and handle confidently; however, tight corners feel unpredictable. But, whatever time we lost grabbing the extra bit of brake, we made up on the straightaways. Unfortunately, the integrated bottle cages and aero module are not the most ergonomically-friendly. We had a tough time with the front bottle cage. Whether we were reaching for or putting our bottle back, it was difficult to find the cage. The aero module is a tight fit but can still hold an inner tube, CO2 cannister and a set of tire irons. Weighing in at 17.12 pounds, the Timemachine Road 01 isn’t light by UCI race bike standards, nor is it legal with the storage box. Luckily, what the bike lacks in weight savings it makes up for in sheer efficiency on the road. Oh yeah, it also just plain looks fast. With the release of so many aero bikes in the last year, the Timemachine Road 01 is a standout bike that should not be left out of consideration. BMC is blurring the lines of these purpose-built bikes; having a smooth ride quality and aero efficiency are no longer thought of as opposites. BMC achieved a new level of integration that needs some tweaking, but will stay around because it is faster and that’s what matters.